US California SuperLotto Plus is a California-only game played in the style of US Mega Millions. The draw takes place twice a week, every Wednesday and Saturday. It started in 1986 under the name California Super Lotto. The name changed to California SuperLotto Plus in 2000. The jackpot starts at $7 million. In 16 February 2002, the then highest jackpot prize of $193 million was won and shared by 3 winning tickets. 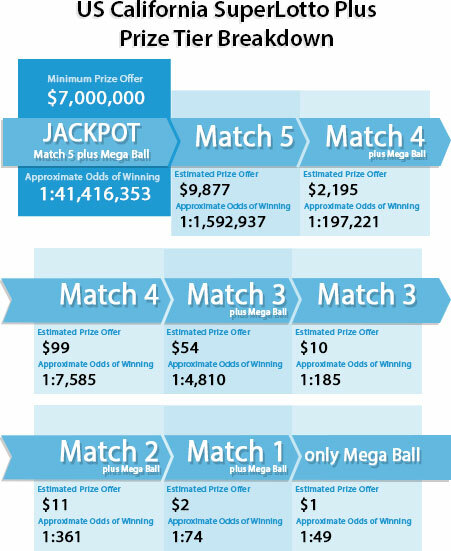 Match 5 main numbers plus 1 Mega number to win the jackpot prize. Choose 5 main numbers from 1-47 and 1 Mega number from 1-27 or use our “Lucky Pick” random number generator. Choose your days. Play for either Wednesday or Saturday draw or choose to play for both draw days. Select your playing weeks. You can play for the upcoming draw or opt to play for multiple future draws. All winning ticket holders will receive a notification email from us. Thereafter, you may withdraw your winnings using your “My Account” page. There are 9 prize tiers offered when playing California SuperLotto Plus. The table below shows the complete prize breakdown including the approximate odds of winning and the estimated prize amount. The jackpot prize starts at $7 million and rolls over to the next draw in case there are no winning tickets. Matching only the Mega number on your ticket will earn you a consolation prize.